24-hour forecast: Generally cloudy with a few showers and isolated thunderstorms around the country, but especially along the coast this morning and tonight then over inland areas this afternoon. Today: Winds: E/NE 5-15 kt. ; seas: Choppy; waves: 2-4 ft.; a few showers isolated thunderstorms, decreasing. Tomorrow: Winds: E/NE 5-15 kt. ; seas: Choppy. ; waves: 2-4 ft.; some showers and isolated thunderstorms. General Outlook: A similar trend occurs on Wed and Wed night. 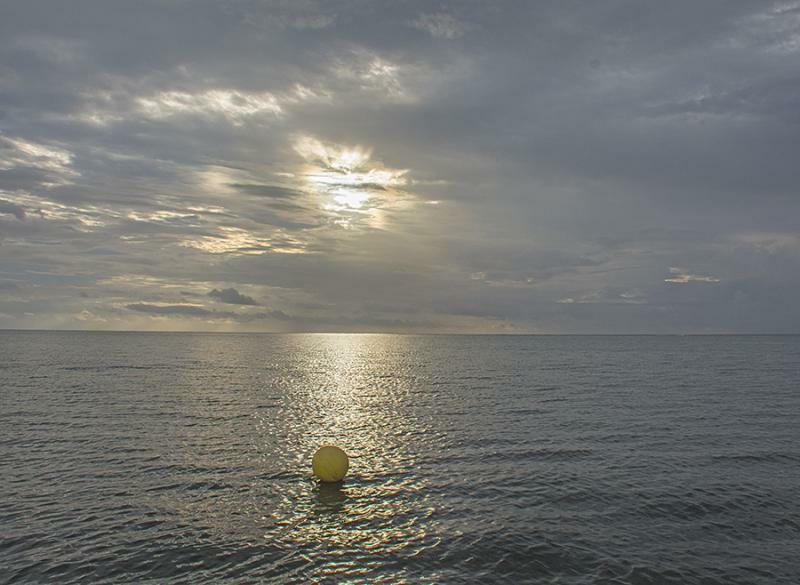 On Ambergris Caye this morning it's overcast and calm with a sprinkle of rain here and there. The expected high is 87. 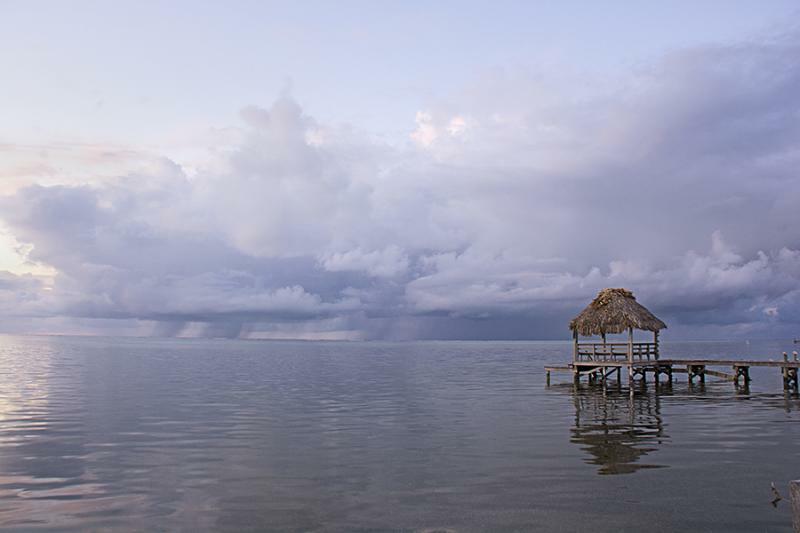 There was rain all around Belize last night, but little actual in Belize. . . .. .This morning there is still rain up north in Mexico and some out at sea. There appears to be some sort of front around the area, which I have shown in Yellow, where the rain is forming. It is all rather turbulent at present. . .. .I am expecting today to be mainly cloudy, probably some improvement during the day and even some sun possibly. We could get some rain, but probably isolated showers, anywhere in the country, but mainly up north. This rolled across the island this morning but didn't leave much water. Looks like that Yellow front line I drew this morning is moving on land not off shore.. . . . 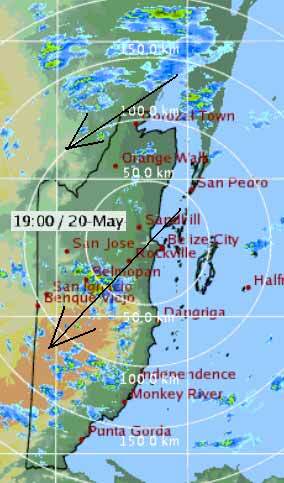 So increasing showers around the country, particularly Belmopan area and later Cayo. 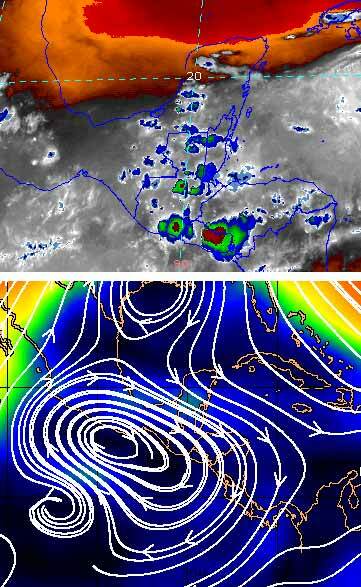 Upper Level moisture is being transported over Belize from the Pacific side of Mexico. This is causing outbreaks of showers over Belize. There was some heavy showers north and west of Belmopan this afternoon. In Belmopan I measured about 10 mm of rain. The outlook is for this pattern to continue for a while longer.